BETTER PRODUCTION Shops Using Technology 116 MMS November 2017 mmsonline.com mill was reduced to 105 hours. These factors have led Napoleon to win more large-par t jobs. Before acquiring the Toyoda bridge mill, the shop was winning between 6 and 14 percent of the large-part jobs it quoted in a year. Now, according to Mr. Febrey, "we are win- ning 52 percent of the work quoted on our Toyoda bridge mill." The new machine has also enabled the shop to make bigger changes. 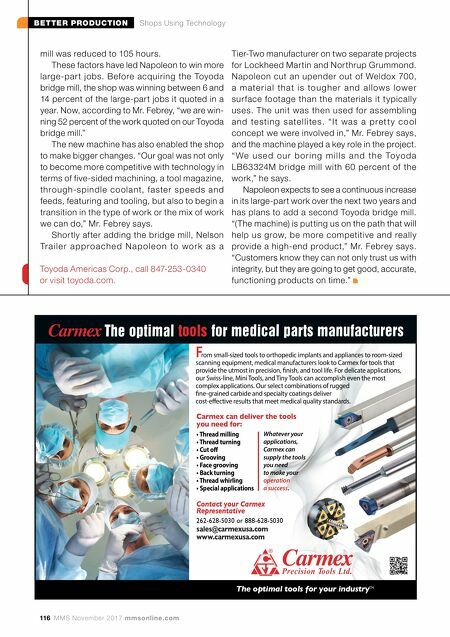 "Our goal was not only to become more competitive with technology in terms of five-sided machining, a tool magazine, through-spindle coolant, faste r spe e ds and feeds, featuring and tooling, but also to begin a transition in the type of work or the mix of work we can do," Mr. Febrey says. Shortly after adding the bridge mill, Nelson Tr a i l e r a p p r o a c h e d N a p o l e o n to wo r k a s a Tier-Two manufacturer on two separate projects for Lockheed Martin and Northrup Grummond. Napoleon cut an upender out of Weldox 700, a m a te r i a l th a t i s to u g h e r a n d a l l ow s l owe r sur face footage than the materials it typically uses. The unit was then used for assembling a n d te s ti n g s a te l l i te s. " I t wa s a p r e t t y c o o l concept we were involved in," Mr. Febrey says, and the machine played a key role in the project. " We u s e d o u r b o r i n g m i l l s a n d t h e To y o d a LB63324M bridge mill with 60 percent of the work," he says. Napoleon expects to see a continuous increase in its large-part work over the next two years and has plans to add a second Toyoda bridge mill. "(The machine) is putting us on the path that will help us grow, be more competitive and really provide a high-end product," Mr. Febrey says. "Customers know they can not only trust us with integrity, but they are going to get good, accurate, functioning products on time." 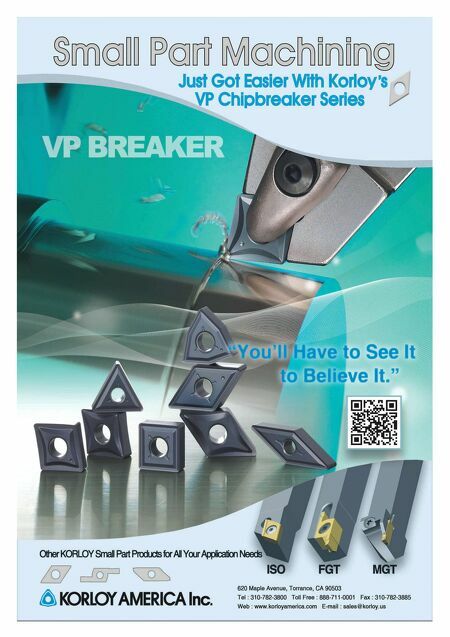 Toyoda Americas Corp., call 847-253-0340 or visit toyoda.com. T h e o p t i m a l t o o l s f o r m e d i c a l p a r t s m a n u f a c t u r e r s The optimal tools for your industry TM F rom small-sized tools to orthopedic implants and appliances to room-sized scanning equipment, medical manufacturers look to Carmex for tools that provide the utmost in precision, finish, and tool life. For delicate applications, our Swiss-line, Mini Tools, and Tiny Tools can accomplish even the most complex applications. Our select combinations of rugged fine-grained carbide and specialty coatings deliver cost-effective results that meet medical quality standards. Contact your Carmex Representative 262-628-5030 or 888-628-5030 sales@carmexusa.com www.carmexusa.com Carmex can deliver the tools you need for: • Thread milling • Thread turning • Cut off • Grooving • Face grooving • Back turning • Thread whirling • Special applications Whatever your applications, Carmex can supply the tools you need to make your operation a success .